Home Sky What is going on in our skies? 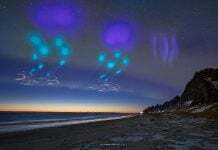 What is going on in our skies? A strange phenomenon was captured by two friends returning from a boat hunt along the Missouri River. 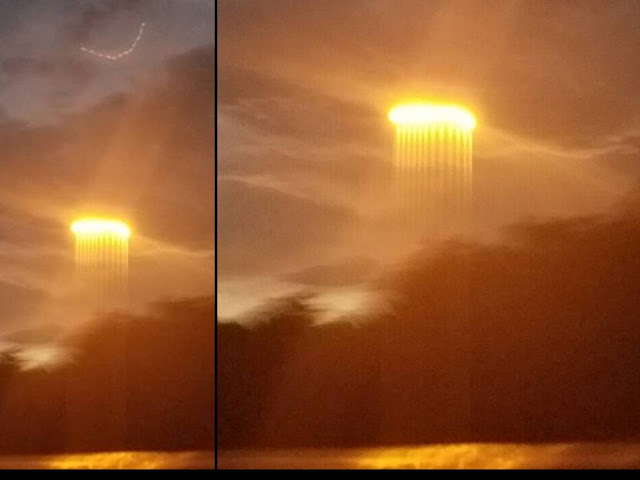 The sun was falling toward the sunset when they noticed a strange group of lights in the sky, and vertical rays falling from the setting sun during a few seconds! 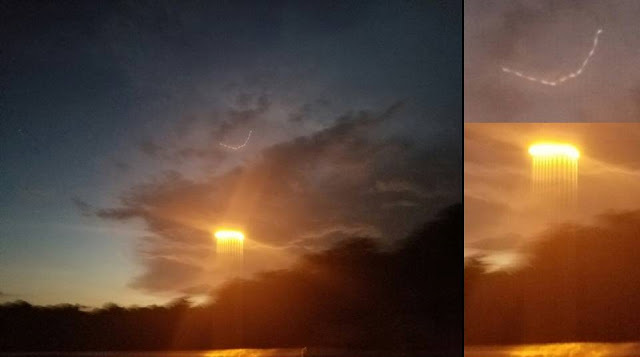 The group of mysterious lights hovering in the sky and the strange crying sun. What is this mysterious sky phenomenon again. I have no clues… Actually nobody has! What do you think this is? The sun between the clouds. Looks like a tractor beam of some sort. Look at the geometrical perfection in it too. Our sun is closer than you think. Research “Flat Earth”, especially Eric Dubai and Rob Skiba. Sun is about 30 miles above earth. 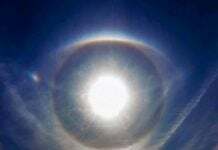 Ever wonder WHY there are so many pictures out there of clouds BEHIND the sun?? Impossible unless the sun is close and at same altitude as clouds. Answer to your question about “Beams of light”…looks like rain showers falling parallel to earth caught in a ‘close-sun’ phenomenon. You are an absolute idiot Glen. If you research patent application 3239660. Closer than we think and is not even a Sun. Glen is correct…The Earth is Flat… We live on an infinite plane and there really are no stars…Which means there are no light years…The light might be instantaneous…We live under a Dome, nothing gets in and nothing gets out…The night sky hasn’t changed since I was a kid or ever for that matter…I know, reality is very upsetting…Everything you know is WRONG! I think it is a psyops to gauge how stupid people really are. In an effort to throw critical thinkers inside a box of ” you must be a flat earther too” BS. Good god. The sooner you people fall off of it, the better, I guess. I for one have always questioned history and things beyond our universe but seriously man it’s time to let the flat Earth theory go!!! Flat earth quacks dont seem to understand that ships do in fact circle the globe. The sun ia no 30 miles away. That is the dumbs thing i have heard in a long time. I guess science and math are just tools that dont really work…30 miles…where do people come up with this crap? Have you done it yourself? Then how can you verify 100% that this is the truth? Perhaps you are just one brainwashed fool who think they know better but doesn’t know jacksh*t in reality?? Stop being a sheep and think for yourself for once. You then just take the torchlight back away a few meter behing the paper, then you’ll seem to see it through the paper. Oh nice, so you know how looks something no-one ever saw ? You’re a special kinda retarded, aren’t ya glendale? The object above is creating the rays emanating below (in my opinion). Another “sign” of the times we’re in as we become more aware of our surroundings. And it is beautiful, to boot. 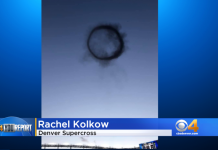 Photo is too indistinct to judge what it is. It`s too smeared and it is unknown if this black bottom is a forest or clouds. Sky is too dark for such sun effect and the “sun” has color very similar to street lamp. Probably just long exposing time photo with shaking camera, and the chain lights could be a star or planet. mans lie, than the TRUE WORD OF THE ONE LIVING GOD YAHWEH!! 12 rays and 12 lights. There are 12 nodules on the cloud and 12 rays from the sun. If true pic, this is very interesting. It is a hair on the inside of the lens, reflecting the light from the sun, which the CCD chip is interpreting the light into vertical scan lines below the sun. CHESHIRE CAT AFTER A LIGHT MEAL TAKING A LIGHT DUMP. It’s a Laser Light show… by satellites!!! Mr alien smiling with delight at all the easy pickins running about. Pretty streams of burning gas from alien torch. Things are just getting warmed up. What is the smiley face looking lights above the lights in question? I believe I know what it is. Nature does not make things like that such as geometrically aligned lights. You can bet your bottom dollar that was a UFO. I don’t believe even HAARP can do that, but maybe Lasers can from a satellite circling in orbit. Our government could also be beta testing their clandestine holography. Yes, we are, as we feel it will serve. First of all, we shall speak of the phenomenal photograph of the sun’s Pillars of Light coming down and penetrating into your Earth. The Energy of these Rays are that of incredible impact upon ALL of the Earth’s FEELINGS. Meaning those upon, within Earth. All Life that lives upon your Planet is affected by this. Its worthless without an Eyewitness, or his detailed description. It’s an amazing feat of Public Relations that some (hopefully small group of) people actually believe the Earth is flat. Truly moronic. If you think the Earth is flat, call a friend in another state a few hundred miles east or west of you and ask them what time it is. Guess what? It’s a different time. Why? Because the sun is in a different place for them than it is for you! That’s because of the curvature of the Earth. We have 4 time zones in the USA. Russia has 11 of them. If the Earth was flat, we’d all be on the SAME TIME! Why aren’t we if the Earth is really flat? directed energy weapon test, AND the earth is flat. о феноменальной фотографии солнечных Столпов Света, спускающихся и проникающих в вашу Землю. Энергия этих лучей – это невероятное влияние на ВСЕ ЧУВСТВА Земли. Это означает всех, находящихся на Земле и внутри ее. Все формы Жизни, которые живут на вашей Планете, подвержены этому влиянию.